Many herbal teas are off-limits while you're pregnant, but white tea in plain form isn't an herbal tea. White tea is safe in small amounts during pregnancy, but check with your doctor before adding it your diet. The tea can contain caffeine and other compounds that are potentially harmful for you or your unborn baby. White tea is made from immature tea leaves that haven't been left to dry on their own as long as darker teas such as black. The tea is made from buds that haven't been fully opened, and the name comes from the fuzz on the outside of the buds that turns white after they're picked and begin to dry, according to the Pacific College of Oriental Medicine. The early harvest time for these buds also ensures that they maintain their antioxidants, which are substances that can protect you from certain medical conditions. Because of these health benefits, white tea can be safe during pregnancy in moderation, but get your doctor's approval before drinking it. Regular white tea contains caffeine, which you should limit during pregnancy. A cup of nonherbal tea, including white tea, contains between 40 and 50 milligrams of caffeine, according to the American Pregnancy Association. Your unborn baby can't metabolize caffeine the way that you can, the American Pregnancy Association says, so it's best to limit your intake. There isn't a recommended limit, however, so talk with your doctor to determine how much, if any, caffeine is safe for you. Decaffeinated white tea, with less than 1 gram of caffeine per serving, is an option if you can't or don't want to include caffeine in your pregnancy diet. Many teas, including white tea, contain a compound called epigallocatechin 3-gallate, or EGCG. EGCG is a polyphenol that has certain health advantages, but it can also inhibit folic acid intake, according to a 2007 article published in "Planta Medica." Folic acid is a B vitamin that helps prevent birth defects, making it essential during pregnancy. Folic acid also enables your body to make the extra blood you need to support a healthy pregnancy. White tea contains polyphenols, compounds in plant foods that can help ward off certain types of cancer, heart disease, diabetes and osteoporosis, according to a 2009 article published in "Oxidative Medicine and Cellular Longevity." A cup of tea has about 100 milligrams of polyphenols, but you can get the same amount, if not more, from fruits and vegetables. 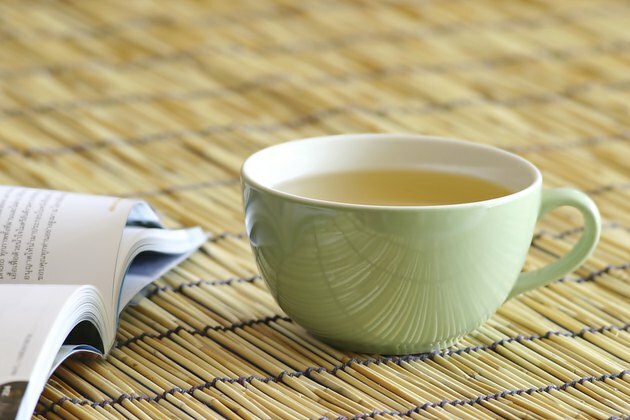 If your doctor gives you the go-ahead to drink white tea, opt for plain white tea rather than an herbal tea mixture. Certain herbal teas, such as rosehip, hibiscus, yarrow, stinging nettle and sassafras, aren't safe during pregnancy, according to the BabyCenter website. So, although white tea might be safe for you, a combination of white tea and those other herbs is not.